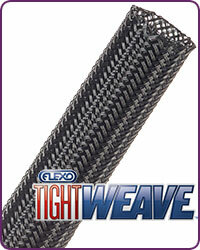 The FLEXO® Tight Weave original braided from 10 mil polyethylene terepthalate (PET) monofilament yarns. The material has a wide operating temperature range, is resistant to chemical degradation, UV radiation, and abrasion. Tight Weave is designed for use in applications where optimum coverage and abrasion resistance is required. The tight braid construction increases the coverage, wear factor and improves harness security. Tight Weave is used in electronics, automotive, marine and industrial wire harnessing applications where cost efficiency and durability are critical. High thermal and chemical resistance and extra coverage make FLEXO® TIGHT WEAVE ideal for customizing and protecting the wires, hoses and cables.